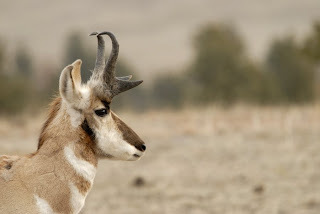 When you have a first-class wildlife sanctuary like Wind Cave National Park to work with, two rules of animal photography come into play - get up early and stay in the car. All of the pictures in this post were taken between sunrise and 8:30 am on March 29, 2008. Not once in that two hours did I step out of my vehicle. 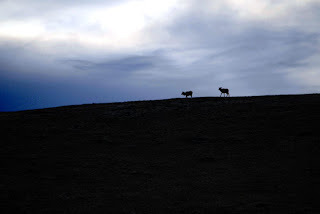 Just as daylight was breaking I discovered the largest herd of elk that I've seen together in a long time. 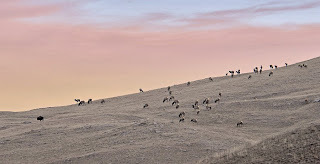 I count 47 elk and one buffalo in this photo and there were approximately 20 more elk out of the frame. Shooting with my 80-400mm at the 400 end of the zoom, I needed a steady support. I was able to set up my tripod between the front seats of my minivan and shoot out the passenger window. 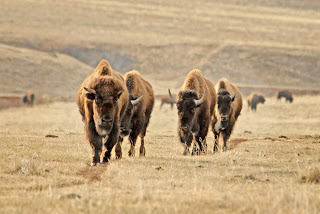 Lucky for me, these bulls wandered down the hill and much closer to my position in a buffalo herd. 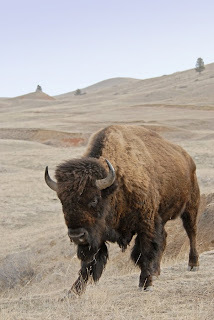 After the elk finished their breakfast and moseyed over the hill, I turned to the buffalo. This guy wasn't much interested in my vehicle and continued on his way after pausing to check me out. 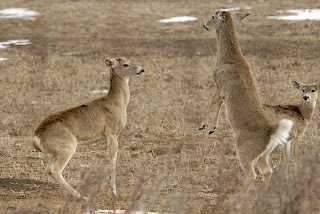 These whitetail bucks were sparring, raring like this and kicking at each other. It didn't seem too serious to me, though, so I moved on. 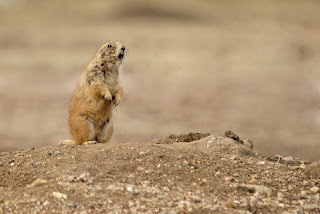 Prairie dogs barked and antelope posed as I passed by. The trail these buffalo were following from a watering hole crossed the road, so I stopped directly in their path. 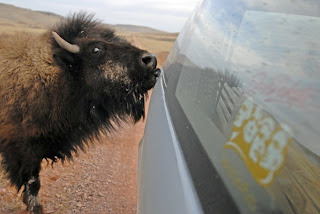 I moved ahead before they reached the road so I didn't force them to take another route, but as it turned out, at least one cow buffalo was happy to see my vehicle. She gave it a great five-minute tongue bath. I'm not sure what was so tasty in the dust, but she slobbered over the entire rear section and down both sides before wandering off. 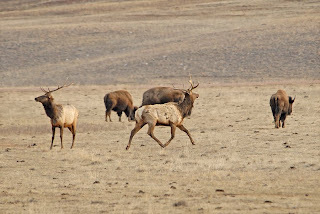 Counting up as I left the park, my viewing totals were over 100 elk, 150 buffalo, who knows how many prairie dogs, about 75 deer, four antelope, six turkeys, a woodpecker and several bluebirds. Not bad for dragging myself out of bed early and spending only two hours actively shooting. I'm really enjoying this blog of yours. Great info, and lots of stuff that I didn't know. Thanks for hosting it! Thanks also for putting me in the photographers' links. I just loaded a new site at greglatza.com, check it out and let me know what you think. Glad you like this blog. I can't believe there are things here you didn't know, but I'll take your word for it. Greglatza.com has got to have some great photos on it. I'll check it out.